The L&N ran from Maysville to Paris, and beyond. agency staff L&N Local Freight Crew in Maysville, February, 1948. “Heavy” Reese, conductor, and D. A. Roebuck, Agent. The University of Louisville Library is the home of the L&N company records. They're all on-line, here. They include a complete set of the digitized employee magazine. “There are twenty-five thousand hands employed on the Lexington and Maysville railroad.” From the Meigs County (Ohio) Telegraph, May 3, 1853. The paper later cited the current number as 1,500, so the original number is suspicious. We’d guess it may mean 2,500 instead of 25,000. Either way, a LOT of workers. The first railroad construction wasn't without its own controversies, here. 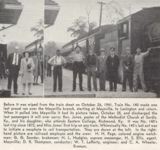 The 1914 L&N Shippers' Guide had this description of Maysville. Both the C&O and the L&N have on-line historical societies. The L&N's is here; and the C&O's is here.